Most of the Traders we speak to who Trade Forex are struggling to make money in the markets and many are consistently losing. There are important reasons why these traders lose, and they are the same reasons a select few are able to earn such an incredible living from their trading. 1. Do you Trade Forex With a Proven Strategy that Works? It amazes us how many people start trading without a proven Forex Strategy. Without a proven plan, failure is virtually guaranteed: yet this is precisely the route most new traders take. 2. Are your Trades Controlled by Solid Risk Management? It doesn’t matter how good your trading method is, if you practice bad risk management you will eventually go bust. Every trade you place must be sized according to a ‘worst case scenario’. Paul Tudor Jones says it best, “Don’t Focus on Making Money, Focus on Protecting What You Have”. 3. Is Your Strategy Adaptive to Market Change? The biggest challenge for traders is to remain adaptive to market change. Many Traders were caught off guard by the recent choppy conditions over the past few years… just as traders grow accustom to these conditions, markets will again change leaving many traders exposed to losses. Let us turn from theory to reality: Below is a chart showing our most recent Volatility Breakout Trade Signals on spot silver which recently booked our clients +11,538 PIPS profit in less than seven days! 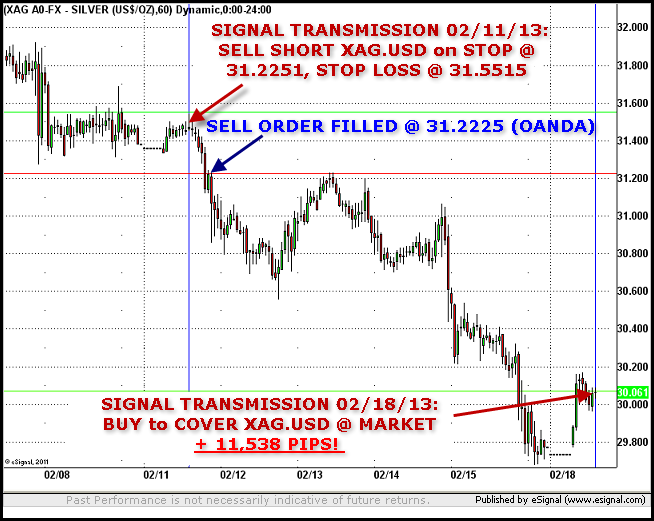 Please note these Signals were transmitted live to our clients in Real Time (02/11/13 – 02/18/13) and are not hypothetical. We have Clearly Defined Trade Rules which govern our entry and exit levels prior to opening our trade. Our Trade Risk is controlled by Solid Risk Management and Advanced Position Sizing Technology which we make available exclusively to our Signals Clients. Our Trade Entry and Exit is Adaptive to Market Volatility and Change.